By default Skype stores chat history on both your computer and the computer of the person you chat with (update: and now even on the Skype servers as well). If we want, we can remove the history with all contacts from our computer, but sometimes it is useful to delete the history with only one contact. There is no such option in the settings, but we can still do it with the method below. It is for Windows based systems. This step will save us if something goes wrong. 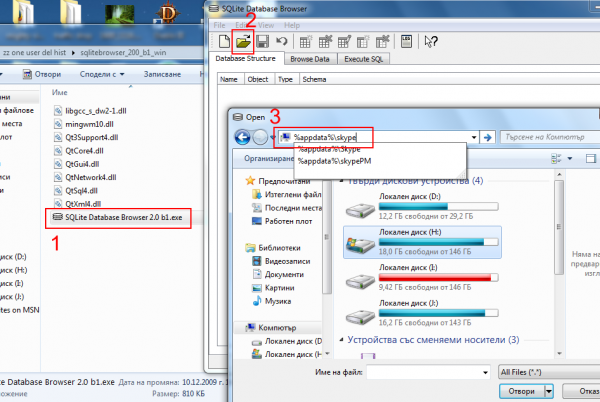 Open a folder or Windows Explorer. In the address bar at the top input %appdata% and hit Enter. Copy the folder named Skype and paste it somewhere safe (for example on the desktop). 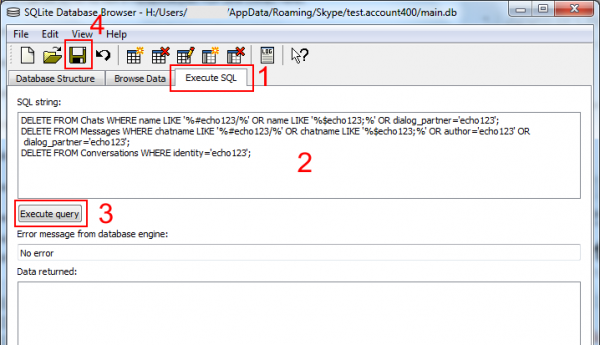 In the address bar at the top input %appdata%\skype and hit Enter. Open the folder with your Skype Name. Delete every file and folder in there except the files config.xml and main.db (depending on your Windows settings you may see them only as config and main). Download the program SQLite Database Browser (Download from Chat4o or from SourceForge.net). Extract it by right clicking on the file and then clicking Extract here. In the program click the button with an opened folder (or from the menu File -> Open Database). In the address bar of the newly opened window input %appdata%\skype and hit Enter. Select the file main.db and click Open. Click on the tab Execute SQL. In the text field SQL string paste the text with the commands from the gray box below (choose option 1 or 2). Don’t forget to replace everywhere the word HERE with the Skype name of the contact you are deleting history with. - Deletes all records, but after you sign in, the ones for the last 30 days may be restored. More on this see comment #19 under this article. - Leaves the records, but deletes the words in them. It will be visible that there was a conversation, but all the words will be gone. This way the history will not be restored after you sign in. After you paste the text in the program, click Execute query. Below you will see a message saying No error. Click the Save icon (or from the menu File -> Save Database). Close the program and sign-in with Skype. If everything is working properly, all you contacts are there, the history of the other contacts is also there and so on, you can delete the backup of the application files we made in the beginning (or not, but keep in mind that the history you deleted is there as well, so technically it is possible to be read by someone). 1. Is the information deleted only from my computer? Yes. It will continue to be stored on the computer of the person you have chatted with. 2. The method above caused a problem in Skype. What to do? In the beginning I recommended you to make a backup of some files. If there are any problems, quit Skype, go to the same place from where you took the files, remove the folder and restore the one from the backup. This will undo the changes you made (it will also restore the history you deleted). This is a very old program. It does not work with new version skype. Also it is not necessary. Your site is one of the best. This is my opinion. It works with the new Skype, at least when I tested it. It gives sometimes an error message, but it still deletes the history. Why do you say it is not necessary? Can you recommend another way to do it? I would be glad to describe it instead, if it is easier or more reliable. I tried using the program with Skype version 5.10.0.116 but it doesn’t work. Note: The token number I listed above, of course, is just a dummy number. Hi. Unfortunately there is no way to offer help for this. It is an old fan made program with no support or updates. When I tried it with 5.10 it showed some kind of error but it still deleted the history anyway :). I am sorry for the not so good way of deleting history for one user. I am open for suggestions for better solutions :). Hmm… I am writing down in my to do list to try to find another way for this. I will edit the article when this happens. Pretty sure I have the most recent version of skype (as of 12/11/12) and it did give an error message (system data sqlite..) but after logging back into skype the conversation was gone. Anyone having trouble should try and make sure they have QUIT skype, not just logged out. Then try. Thanks for the help Nikolay! Hi. Thanks for sharing your experience with the program :). Regards. thank you for your effort with this website. I do not know whether this info is exact. When you end your chat and erase it (Tools> Options> Chats&SMS> buton “Clear chat history” and confirm it in dialog window the chat is displayed on other computer if Skype is opened on it. Seems to do what it says on the tin. It creates chat backup before cleaning and you can roll everything back or keep it separately from Skype. Make sure you give admin permission on the program and make sure skype aint running. Hi. Thanks for the feedback and the idea about running it as administrator. I have added this to the article. Long-benefit for selective cleaning of the history of Skype. But recently switched from XP to Windows 7 64 bit. Here SKYPECHATREMOVE complains that it can’t load the System.Data.SQLite. Downloaded from you “version for 64 bit Windows”, not working! Hi. The program is made long before Win 7, so it is only natural to not work correctly there. But I want to mention that I have found another method for this and I am in the process of translating the article to english. So soon there will be a whole new article on this same page. It is more complicated but it is better. I have completely remade the article above with a new method that is more complicated but more reliable and should work fine. Let me know if it works for you or not.